One of the downsides of virtualizing your record and CD collection is that you can’t just look at it anymore – instead, you are staring at a user interface for a searchable database on your computer or mobile device. Still, every so often you manage to come across an album that you fondly recall as a favorite, but haven’t heard in years. 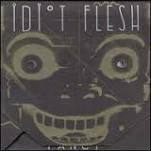 Recently, that happened for me with Idiot Flesh‘s third and final album, Fancy. Enjoy this AMN retro-review. Trying to pigeonhole this group is an exercise in futility. The closest comparison would be their contemporary, Mr. Bungle. Clownish, theatrical, punk-influenced experimental rock with disturbing themes and dark humor is the norm on all of their albums. As for influences, listen carefully and you’ll hear strains of The Residents, King Crimson, heavy metal, modern classical, Captain Beefheart…the list goes on. Despite being a four piece, Idiot Flesh moves seamlessly between power chords, avant chamber rock, and even approaches being orchestral. The group consists of Nils Frykdahl and Gene Jun on guitars, Dan Rathbun on bass and Wes Anderson on drums and percussion. But their instrumentation also includes flute, castanets, violin, cello, trombone, marimba, bassoon and found objects. All four members contribute vocals. Fancy also includes around 10 guests on vocals and additional instruments. The emphasis here on vocals is not by accident. All 13 tracks feature singing to some extent, many including large choral elements, and assorted background spoken-word craziness. If we are going to start anywhere, it has to be with the 9-minute Chicken Little. The group gives writing credit to Iannis Xenakis, Pierre Boulez, and Bela Bartok. But just dropping those names won’t necessarily given you a lead on the direction of this track. Complex heavy guitar themes with intricate bass / drum parts are predominate. Interspersed are silly lyrics, and occasional flute and violin breaks. In the middle of the track, the group partakes in a semblance of a country / western hoedown, fiddles and all. But Fancy actually begins with a demented circus piece, Dead Like Us, featuring bouncing horns that belie the dark content of the choral singing. Following this is Idiot Song, another clown-rock piece with slow atmospherics. The album also includes Twitch, a grinding industrial-influenced piece, with shouted, distorted vocals and staggered rhythms. Drowning explores a slice of an addict’s life. The lyrics on all of these tracks tell disturbing stories of disease and death, recurring themes for Idiot Flesh. To that point, Teen Devil Worshipper explores the sicker side of the group while telling the (unfortunately true) story of a list-obsessed ritual murderer. Here, the vocalists chant through the lists in the first person, not unlike the Dead Kennedys would do when personifying deplorable acts. Other tracks that include the group’s twisted sense of style (though in a more humorous fashion) include Cheesus (Dance Mix) and People in Your Neighborhood, the latter a funk and blues oriented, sarcastic take on Sesame Street. Needless to say, Fancy is not a happy album. Funny at times, possibly offensive, and ridiculously creative, but not pleasant. Frykdahl and Rathbun went on to form Sleepytime Gorilla Museum with Carla Kihlstedt. The same three, along with Anderson, contributed to early Charming Hostess recordings. All members have more recently been involved with avant-garde stage productions and performance art. Fancy is 20 years old. Does that make it an oldie? Or a classic? Regardless of categorization, no efforts aside from those from Mr. Bungle come close to the twisted sounds that emanate from formally-trained minds and limbs of Frykdahl, Jun, Rathbun, and Anderson. A desert island disc indeed. Inverted Space Ensemble presents its 5th Annual Composers Concert. This concert is dedicated to presenting newly composed works alongside a diverse mix of contemporary and experimental music. Featured composers are Charles Corey, Jacob Sundstrom, Ania Stachurska, Clint McCallum, Sergej Newski, Beat Furrer and John Cage. Percussionist Melanie Voytovich and friends bring you a night of new work with premiers by Bradley Hawkins and Ella Maher/Melanie Voytovich + works by Benjamin Marx, Elliot Cole, Ivan Trevino, and David Molk. Featuring Storm Benjamin, Scott Langdon, and Maggie Brown (percussion), Brad Hawkins (cello), and Ella Maher (dance). The Frequency Series, programmed by Reader staff writer Peter Margasak, presents new classical and experimental music at Constellation nearly every Sunday night. Its first concert was in April 2013, and the series celebrates its (almost) fourth anniversary with its second annual festival, which this year runs from Tuesday, February 14, through Sunday, February 19. Constellation hosts four of its seven concerts; the other three are at the Museum of Contemporary Art, the U. of C.’s Bond Chapel, and the Art Institute’s Fullerton Hall. It is a MASSIVE release by ART ZOYD of all previously unreleased material. It will cost us a fortune to manufacture this, and we do not have a fortune, so we are asking Art Zoyd’s fans and our friends and fans to help us to be able to release this by paying for their copy in advance directly from us. This will give us the needed funds to pay for its manufacture which we need in order to make this set a reality. ICE returns to Chicago for its next iteration of OpenICE, featuring four days of free programming from February 17 to 20. The weekend launches OpenICE’s partnership with the Rebuild Foundation, and concludes with a special President’s Day presentation of Tyshawn Sorey‘s Perle Noire: Meditations on Joséphine, a re-imagining of Josephine Baker’s work, featuring acclaimed soprano Julia Bullock. Throughout the four days, ICE presents open rehearsals, discussions and workshops in collaboration with Chicago-based composer Morgan Krauss and Stony Island Arts Bank resident artists Train and Maggie Brown, as well as engagement activities with Glass Lantern Slides, a collection of over 60,000 slides from the University of Chicago’s Department of Art History housed at the Stony Island Arts Bank. Aaron Siegel was born in Maryland, educated in Michigan and has been living in New York City since 2001. He has studied with Alvin Lucier, Ron Kuivila, Anthony Braxton and Bunita Marcus among others. In addition to composing and leading his own ensembles, since 2011, he has co-lead Experiments In Opera, with whom he has produced over 30 new operatic works since its founding in 2011. Aaron is a multi-faceted composer/performer, a unique individual and great guy.